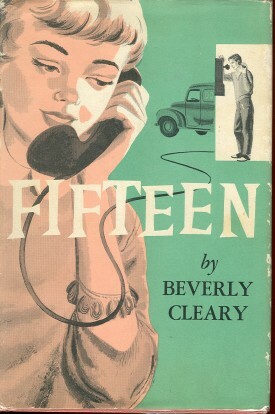 Heroines of fifties teen romance novels tend to share similar characteristics. The heroine is generally not a beautiful girl, but perfectly pleasant on the eyes. She tends to get along well with her family, although there's always a little tension with either her older sister or her bratty younger sibling, or some combination of both. Her parents (and she does tend to have two) are usually the good-natured, easygoing, dry-humored type. At school, she tends to work on the school paper rather than being a cheerleader. She is not the most popular girl, but she's not a cast-out wallflower either. She generally has two, or three good girlfriends and enough friends for a good-sized dance party in someone's furnished rec room. She may start the novel with a steady beau—-generally of the tall, dark, handsome and good-natured variety, or pick up one during the novel. Even if she does have a steady beau (who is always respectful and kind), she may undergo a brief flirtation with a taller and more handsome boy who is usually slightly less good-natured than her steady, but often far more exciting. Dates often include long walks, trips to the malt shop, formal and casual dances, and the aforementioned rec room get-togethers, complete with listening to records, dancing, drinking soda, and perhaps the odd bridge game.